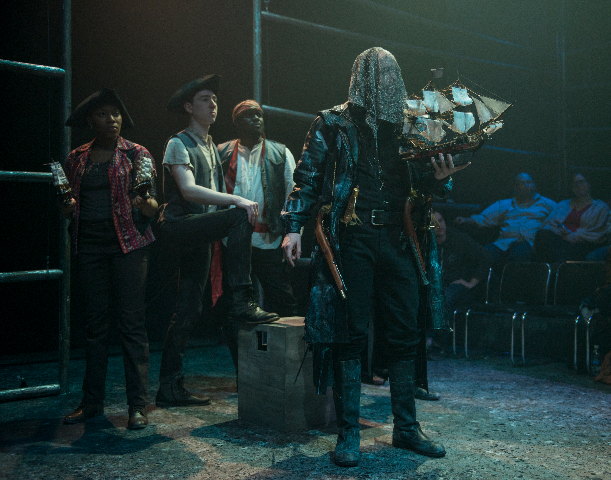 Part Two: The Crownless King; Parley with Pirates (In front) Joe Bianco as Davy (Behind L to R) Krystal Worrel, Ben Hertel, Abu Ansari. 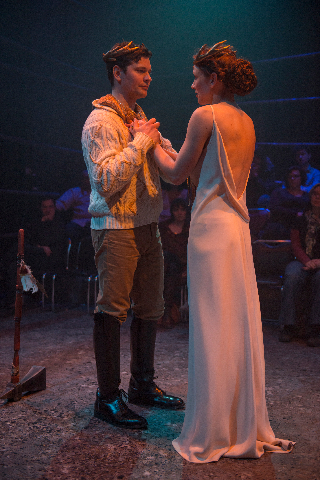 Part Two: The Crownless King; After the Wedding (L to R) Kevin Stangler as Casper and Kara Davidson as Rienne. Part Three: The Excelsior King; July rides the stag into battle; Puppets created by Jesse Monney-Bullock, Kay Kron as July. And I, as well as several others, were. I can’t speak for the others, but it was an honor to be hammered in this instance. Not clobbered. Not creamed. Not beaten down or any other such adjective used to suggest harsh defeat. Rather, one was inspired and impressed by the dizzying but delightful display of diversity that had unfolded during the course of a 9 ½-hour, seven-act play featuring 51 roles and about 20 actors and 18-foot dragons that, even with breaks, tested the endurance of the audience as well as the performers. The epic trilogy that is “The Hammer Trinity” – part action-adventure series, part Arthurian legend, part Western tale, part pirate yarn, part Sci-Fi saga, part Shakespearean-like experience, part super hero/comic book spectacle, part horror flick experienced live, -- makes the 3 ½ hour- “August-Osage County” seem succinct by comparison. “The Hammer Trinity” might bring to mind “The Lord of the Rings” series, “The Chronicles of Narnia” epic, “Star Wars” and a host of other tales and series that have woven their way into popular culture. During the course of its run at the Adrienne Arsht Center in Downtown Miami, in the intimate Carnival Studio Theater, folks had the choice of seeing one part, two parts or experiencing the entire series in one sitting (with four intermissions and two one-hour meal breaks). Even with only one performance remaining on Saturday, May 7 theatergoers have the choice of seeing one, all, or none of the saga. But walking away having experienced it all gives you a feeling of perhaps tiredness, understandably, but also triumph. It is a rush not unlike having completed your first marathon when your mind and body told you repeatedly it’s time to quit. Fortunately, the story – and the brilliant performances by the actors and the incredible work by the technical team -- will save you from falling asleep or leaving. The intimacy of the theater makes the production much more immediate and powerful than if it were taking place in a large auditorium. The authors of this deceptively simple tale of a magical, heavy hammer that keeps the lands of a universe unified have bigger things on their mind than the simple, minimal text of a comic book. What is the purpose of stories? Are what we know as “history” and “facts” and “the truth” merely versions of what has occurred, according to the person or people telling it? What kind of rulers do we want governing our country? It is a question particularly timely in this combative election season. But as much as Allen and co-author Chris Mathews might intend us to think, there are simply too many elements. 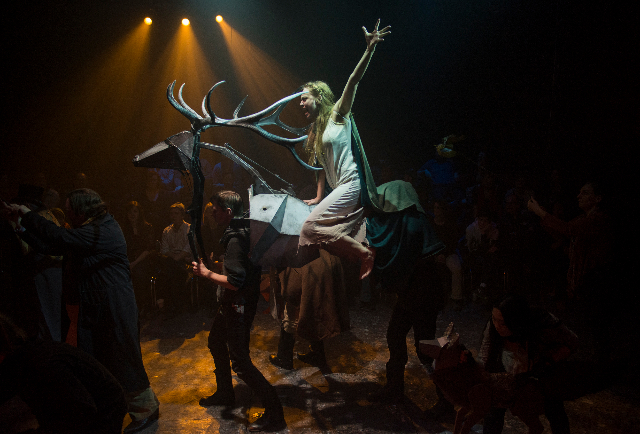 The audience deals with too many visual effects, sound effects, lighting effects and puppetry, narratives and characters to keep their minds clear and thinking. There is a lot to contend with during and immediately after a theatrical event of this proportion. A good part of this mammoth show features war scenes--made all the more powerful due to the intimate Carnival theater space, featuring a "runway" style stage which allows for much movement and characters to be highlighted. Audience members are seated at either end of the low stage reinforcing the idea that we're watching a battle scene. The unspecified setting isn’t the only location being bombarded; our senses are as well. To further complicate matters, this story of a hero-turned king who fights for the hammer, protecting what is right for the land, is a difficult tale to follow. You may find yourself and the tale’s messages lost in an attempt to keep up with the action and story, which I described in a VERY basic manner above. Certainly, an understanding of the story and its characters is essential to keep up with the proceedings. But – and this is a huge but – even as furrows form on your forehead as you try to process what’s occurring onstage, you’ll find yourself riveted to the stage. That’s due not only to the countless spectacular visual effects, but to the urgency, honesty and conviction with which the actors invest their roles. Subtle—and not so subtle—facial expressions and tones of voice help immensely. Wide eyes, a soft but sinister tone of voice and a drip or two of arrogance from a facial expression bring these characters to vivid, vibrant life. There are too many performers to single out, and they’re all fantastic, but special kudos must go out to Raymond Fox, as one of the storytellers. In the beginning, he has an easy charm and enthusiasm, a la Willy Wonka. But he, like so many of the other performers, seamlessly transitions into other more authentic, serious emotions. Joey Steakley deftly conveys a narcissistic, arrogant and heartless personality as Henley Hawthorne – a member of a group calling themselves “The Hand,” which banded together to raise the hammer and rule on matters of greater good before developments divided them. Another cast standout is Kay Kron, who loses herself in the role of July of the Seven Foxes, a novice storyteller who has the chance to save the land from self-destruction. Kron’s wide eyes convey a sense of urgency, which is also expressed through the intensity of her voice. Her performance, while intense, never feels forced. And, of course, there’s our hero, Casper Kent, an unsuspecting son of a poor farmer who learns about his royal status. 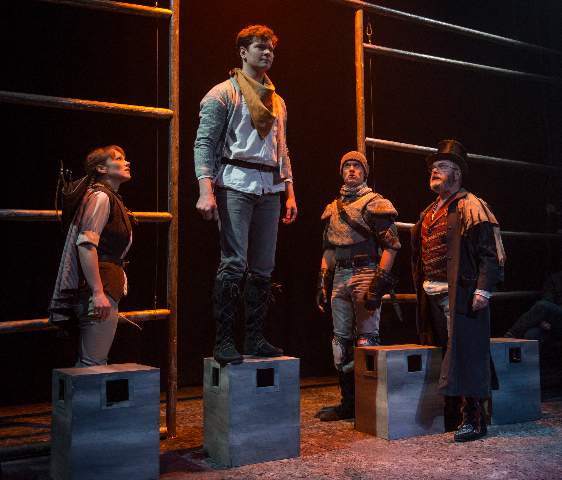 He’s brought to energetic life by Kevin Stangler, who at first imbues our young hero with a fresh-faced innocence before transforming into a dashing, romantic ruler who might bring to mind Prince Charming. Like in “Cinderella,” there’s plenty of make-believe in “The Hammer Trinity” but not the mysterious, “how did he/she do that?” kind. When we see “animals” appear on stage, their human handlers are in clear view and we can clearly see and hear that they’re making the noises “coming” from the pretend animals. Yet we’re so invested in the story and the characters, we don’t care that we can easily identify how the actors are making stage magic. So when an actor runs onto the stage with an obviously toy airplane, we don’t care. Like in the Peter Pan prequel “Peter and the Starcatcher,” in which the actors in plain sight perform magic with a few props, we’re so emotionally invested in the characters and the story that go along with the “Let’s pretend” state of mind. The frequently repeated phrased “Story Save Us All” reminded me of the oft-repeated phrase in “Starcatcher” “God Save Her,” whenever Queen Victoria’s name is mentioned. While there’s no real thematic connection between the phrases, there is one between the hammer that Kent tries to secure and Excalibur, the mythical sword of King Arthur often linked to magical powers or the rightful rule of Great Britain. A hammer and a sword have saving powers, according to the Arthur legend and that of the “Hammer,” but so do stories. Or do they? Well, in real life, stories people tell, true or not, can cause hurt feelings, rebellious acts, even hangings. Look no further than what happened during the Salem witchcraft trials, when people’s “accounts” of others practicing witchcraft led to the hangings of the accused. And today, some only hope that some story (again true or not) told about Donald Trump will prove to be his undoing, denying him the Republican presidential nomination. Of course, we all look to stories, especially entertaining, highly theatrical ones such as “The Hammer Trinity” to “save” us, at least temporarily, from the realities we must face in our often frightening world. As skilled as the acting is, as vivid as the varied lighting and sound effects are and as visually delicious are the sights on stage, including Melissa Torchia’s eye-appealing costumes, we need those intermissions and meal breaks to save us from burn out. 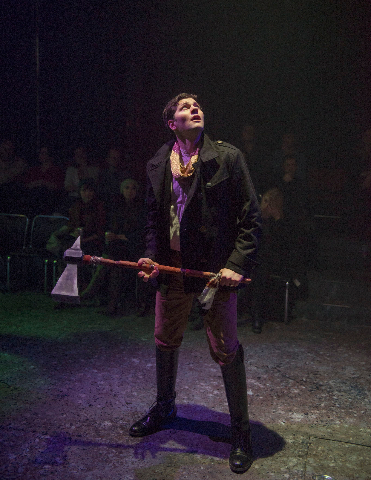 That’s true not just for “The Hammer Trinity,” but other epic stage experiences such as The Royal Shakespeare Company’s similarly lengthy “The Life and Adventures of Nicholas Nickleby” by Charles Dickens. The breaks, the skillfulness on stage and the power we exercise over our mind (not the other way around) can all save us from burning out or chickening out and not staying for the entire 9 ½ hours which, by the way, never dragged. So after you’ve endured it all, a staff member will place a sticker indicating “You’ve Been Hammered” on your shirt. It won’t feel like a dagger through your chest, but a badge of honor placed delicately and with ceremony by the staff member. 1 p.m. Saturday, May 7. $150 for all three parts. Call (305) 949-6722 (305) 949-6722 for tickets. Reposted courtesy of Aaron Krause and Constructive Criticism.